1 to 100 is a project about how in the 2030s workplac­es will support companies’ growth and individuals’ well-being. We believe a physical workspace will remain vital for collaboration and teamwork, so we propose to provide a platform of flexible and scala­ble workspaces, with engaging amenity spaces, in multiple locations around central London. In an online survey, we found a latent need for well-located rentable workspaces where small offic­es can establish themselves, attract the best staff, and then expand seamlessly. This valuable segment of growing companies is a rich opportunity for build­ing owners and operators. 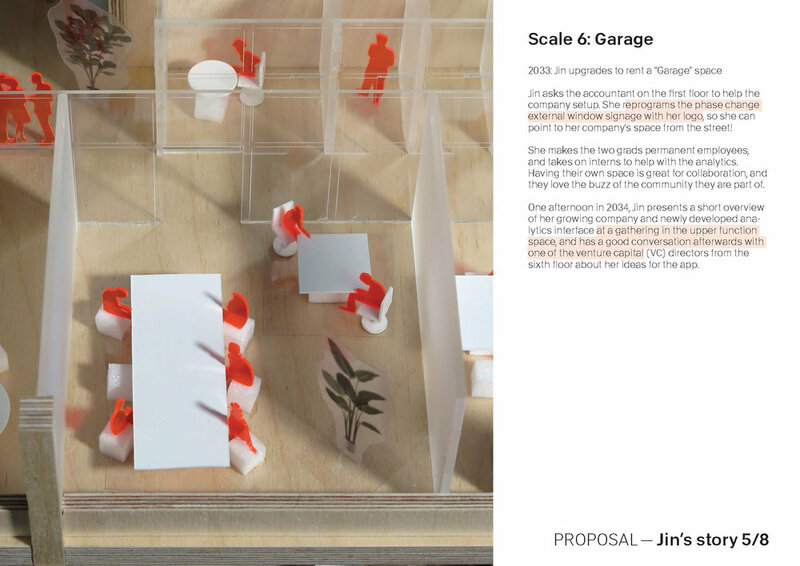 While studio-scale managed workspaces of up to 40 staff exist now (WeWork etc. ), the key next stage of growth from 40 to 100 is not currently well provided for. For companies both now and in the 2030s, especial­ly those with external funding, the ability to grow is a vital—and extremely valuable—competitive advan­tage. As the collaborator most familiar with the needs of the occupiers, our role was to develop a believable strategy for seamlessly accommodating growth for larger companies in a space where the ultimate level of flexibility is sought. 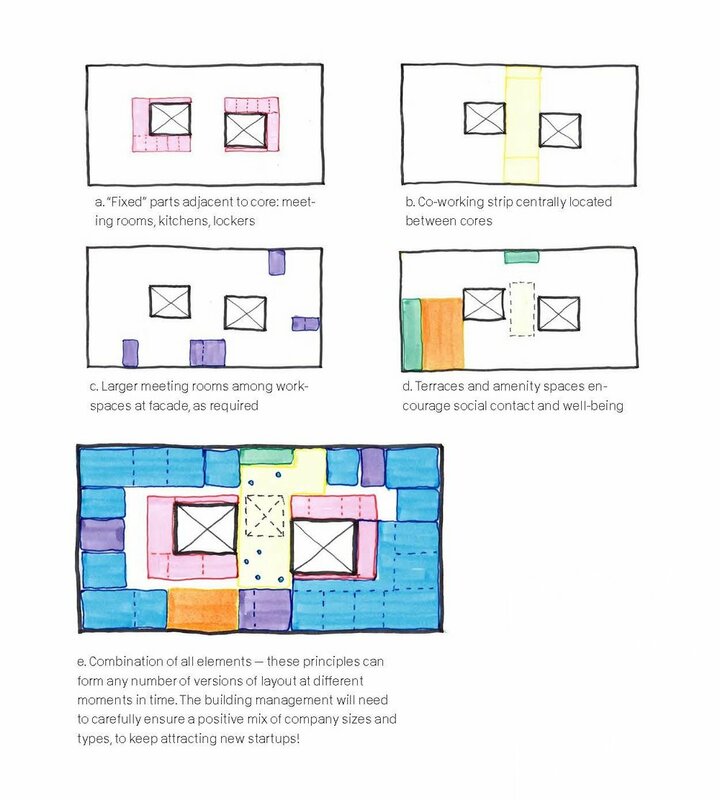 To accommodate the upper ends of this range (from 40-100), we developed the concept of a fixed but distributed set of amenity spaces, expanded to reflect the changing demographics of 2035. Understanding that the servicing of these spaces makes it often very difficult for them to be truly flexible (i.e. for our purposes, able to be relocated in a weekend), we looked instead to lock these in place, at distributed patterns representative of where along the spectrum they fell. In other words, the earlier an amenity is required, the more common and more distributed. The later, the fewer and more centralized. 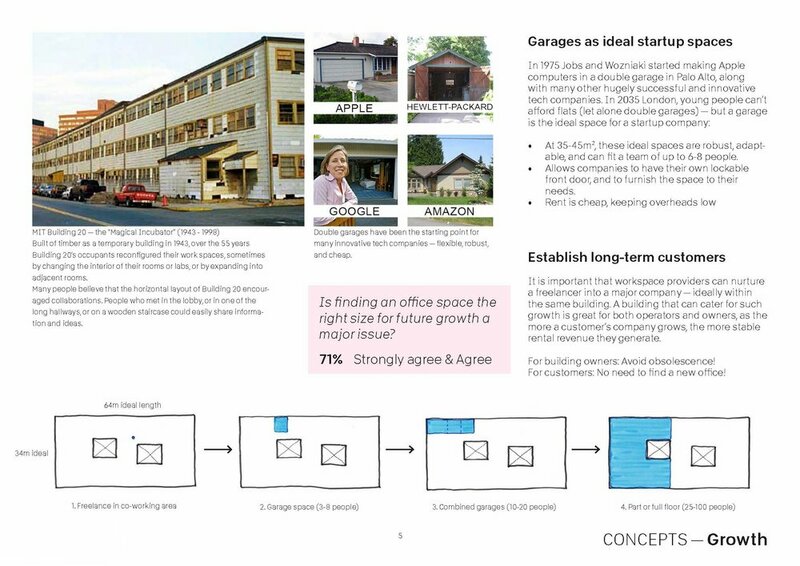 Taking advantage of the natural urge for growing companies to generally expand outward from existing spaces, this strategy allows the most changeability within the actual office area. Amenities are distributed evenly, almost in the background, treated like a fixed service in support of and enabling the hyper-flexible office area.